Echoing the words from Michael Hudson/Plymothian Transit, Michael Hudson will be wheeling out the beast that is Leyland Atlantean TTT 168X once more this coming Sunday for an enthusiast's trip around the city. 168 will be re-living her past career all in one day, re-tracing steps of years gone by on various routes she completed over her 25 year career. One service in particular that Michael is keen to replicate on Sunday will be the 35 to Ham, which was the first service TTT 168X was ever used on, way back in 1980. If you would like to join Mike and many other enthusiasts for the outing on Sunday from 10am at Milehouse, please do let me know, or alternatively have a look at the Facebook page for the outing at http://www.facebook.com/events/354849727882738/ A donation towards fuel will most certainly be welcomed seeing as diesel is now on its way above and beyond £1.40 a litre! 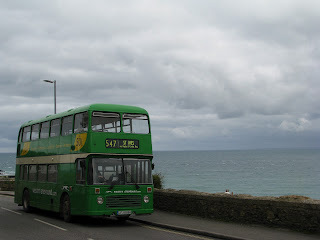 BSOG most certainly doesn't get paid towards preserved buses! And it looks like you might have to be doing it quite a lot. This is the new pre-production timetable for A-Line's new batch of services starting in April, so I'll give you a brief overview of what's going on! There are also changes to the 80 which currently acts as a peak time circular serving Cawsand, Millbrook and Anderton on its way to Cremyll in the morning, and vice versa in the evening. 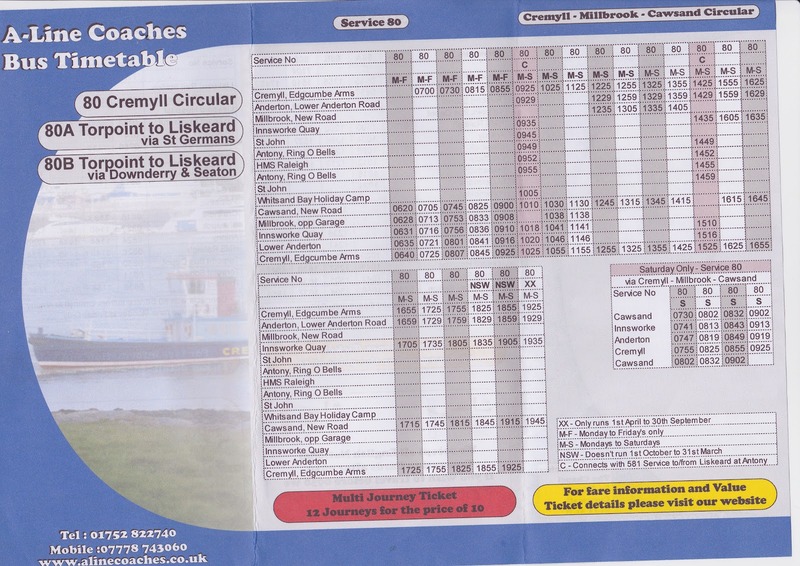 These will stay the same other than a small change in the afternoon peak with all services leaving all stops 5 minutes earlier than the currently do, to allow better connections with the Cremyll Ferry, which undoubtedly will be much appreciated! I experience the 8 minute wait in Cremyll daily, and although its not the end of the world, its enough for people to attempt to find lifts from other ferry users, or alternatively, will prevent people getting as wet as they currently do while waiting for the 80. 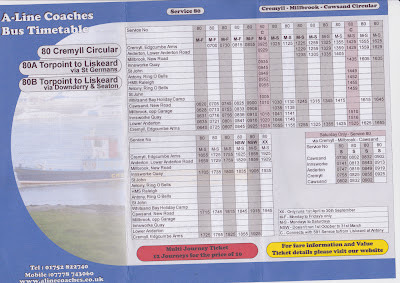 The bigger change is that out of the peak the 80 will run two circulars from Cremyll serving Millbrook, St John, Antony, HMS Raleigh, Whitsand Bay, Cawsand and back to Cremyll in both clockwise and anti clockwise directions, which is why the timetable is somewhat hard to follow on this portion. 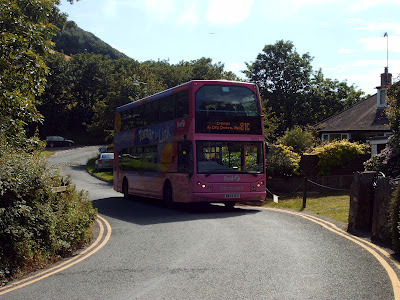 These time in with the Cremyll Ferry each half hour (apart from the long 80 missing out 2 of these) and will void the gap of First no longer serving Cremyll on the new 81C. So plenty of changes, and a fair expansion on A-Line's current operations, we just have to wait and see now if it will be a success! I post this photo of Trident WA54 OLP, 32757, 'Cormorant' for no other reason other than I really really like it! Was looking back through some old photos the other day, and came across this shot from the summer of 2007, and what a glorious one it appears to have been! Even more surprising is that this was taken using my old comparatively amateur Vivitar V3935, and yet I wouldn't be afraid to admit that the quality actually looks superior to my current Canon S5IS. That said, even the Canon is getting on in its years. I've owned it for nie on 4 years now but certainly have no reason to let go of her just yet. The S5 has been a lovely dependable, easy to use camera, able to deliver a really good range of shots as well as having a surprisingly good recording facility. Looking back though it seems that now and again, by fluke, the Vivitar seems to trump the Canon. A vast majority of photos are very poor in comparison though! ...although weirdly at this point, this LH wouldn't have looked totally out of place! This is another wonderful photo sent to me by Chris Thomas showing LH KTT 39P still in her red guise from her time spent within Devon General in August 1983. 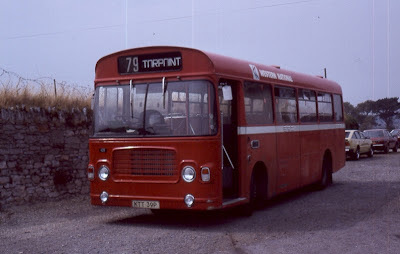 I say she wouldn't have looked out of place due to the GOL-N and JOX-P Leyland Nationals that were used for a time at Torpoint in the poppy red that they had inherited from their original operator, Midland Red. They may well have all been painted out of the red livery into the Ferrybus livery by this point actually come to think of it, but I'm sure there are some more knowledgeable people out there than myself who can correct me if I'm wrong. The Midland Red Nationals I believe were added to the fleet at Torpoint in the mid seventies, but I have no idea as to when they were re-painted into the very attractive dark blue and white/grey Ferrybus livery. 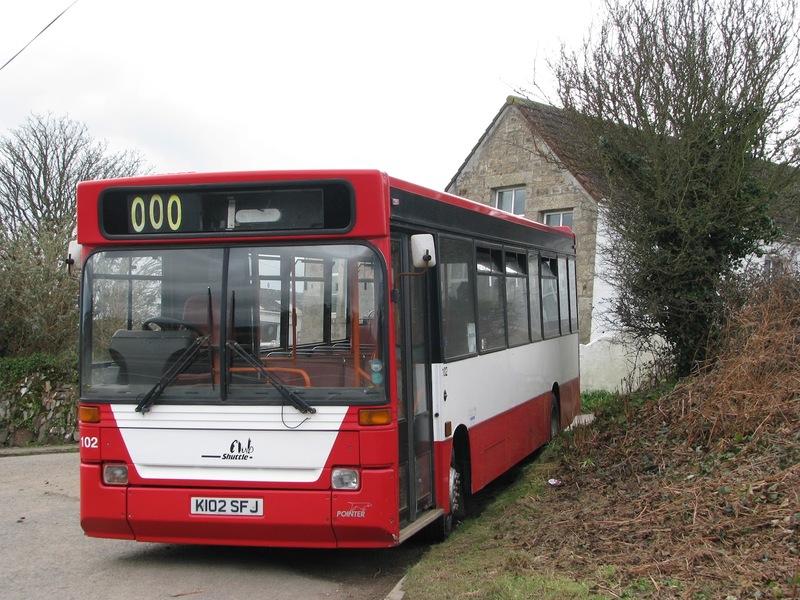 Anyway, back to the LH, KTT 39P joined the North Devon Limited split of the original Western National Omnibus Company on January 1st 1983, only to then be sold on to Western National Limited the same day! Not sure what point this made it down to Torpoint, before now I didn't know any of the KTT-P batch had been used at Torpoint, so certainly a surprise, then again I would presume any LH could have been used on Torpoint services thanks to no modifications being needed to enable them to make the trip. Thanks once again to Chris for allowing me to share the photo with you. 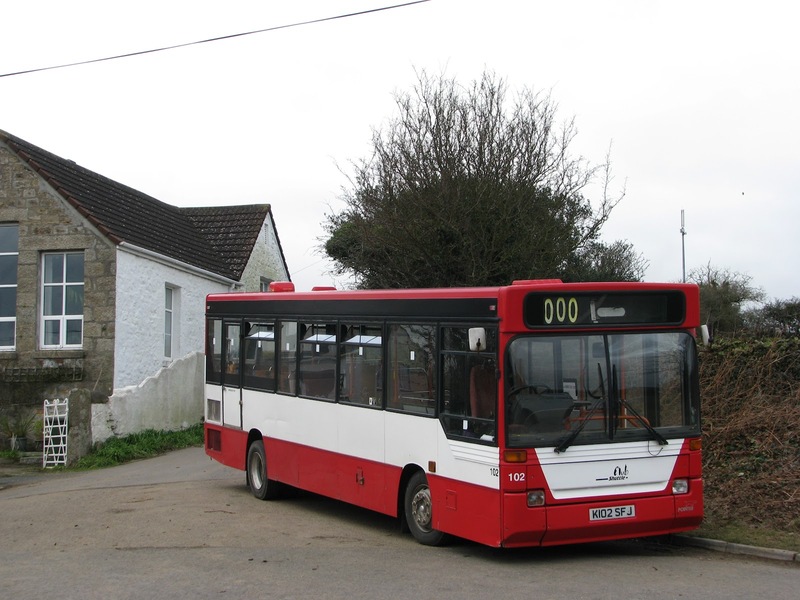 As reported on last week, Western Greyhound have been getting VR LFJ 858W out and about on the roads of Cornwall in public service so last Monday I grasped the opportunity to sample the beast, operating on the 547. 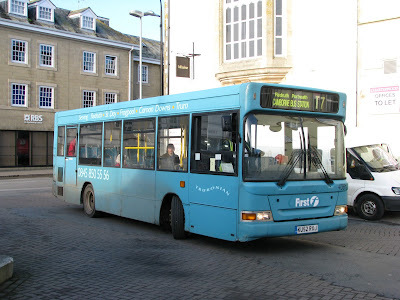 547 is got to be one of my favorite routes in the region, with the full route taking it right the way along the coast roads from Newquay to St Ives winding through Cornish villages, thrashes along link roads, and rolling gently through countryside, the ideal combination for experiencing the VR at its best. I have therefore included a short clip below for you to bask in the delight of the Gardner whaling, really worth it if you've got a spare couple of hours. 547 during the winter is only Monday-Friday operated though, but has occasionally been used on weekend working, including the Plymouth trip a couple of Saturdays ago. 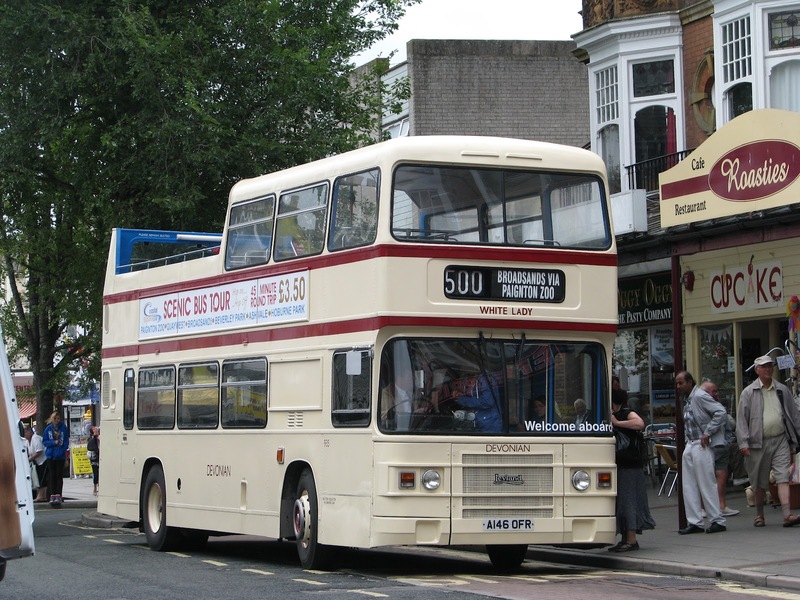 Even better, Western Greyhound's original VR, Ex Brighton and Hove JWV 259W has just been put back on the road following a spell out of use. 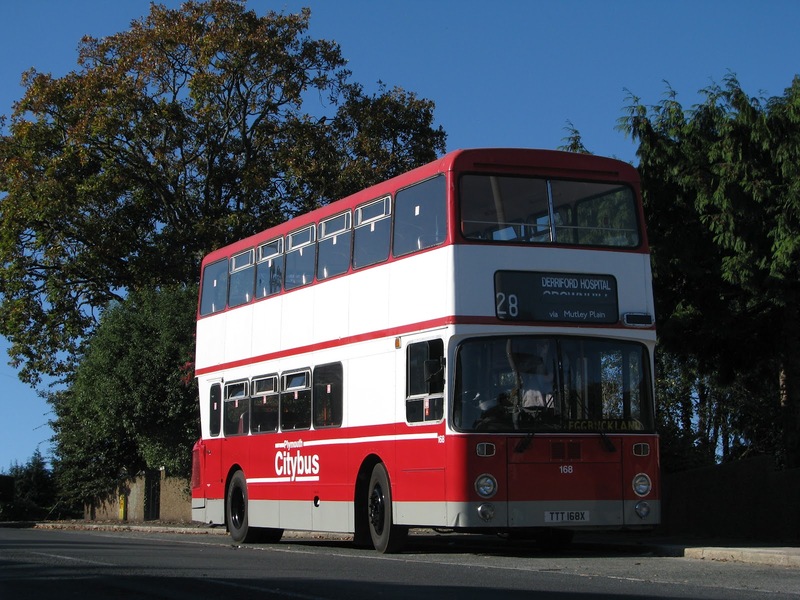 I believe 858 is currently the only VR operating in public service, seeing as a majority of the surviving operational VRs are open toppers used in the summer only, or are used solely as school buses, with companies such as Emblings and Johnstons. 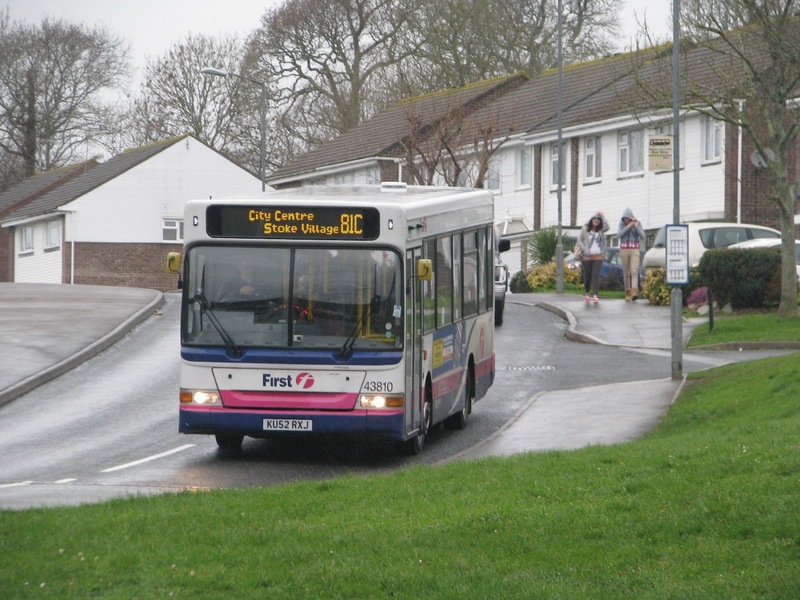 Of course we're steadily closing in on the DDA regulation dates for the withdrawal of all step entrance buses, 2015 for single deckers, 2016 for double deckers North Somerset coaches in particular are taking advantage of this while they can, using Bristol RE YHY 592J on public service regularly, most certainly being the only RE in the UK still in regular use in public service, another bus I'd love to ride on before she is relegated out of public service in 2015. 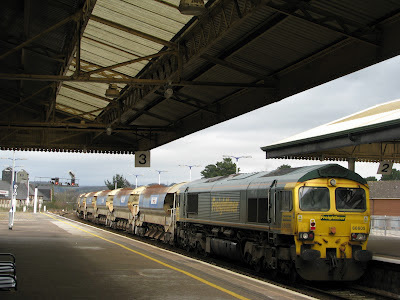 Seeing as I rarely seem to post rail related photos/stories, here is Freightliner Class 66, 66605 seen at Newton Abbott station on Saturday morning with what I shall completely guess about, is a rake of ballast wagons in tow? 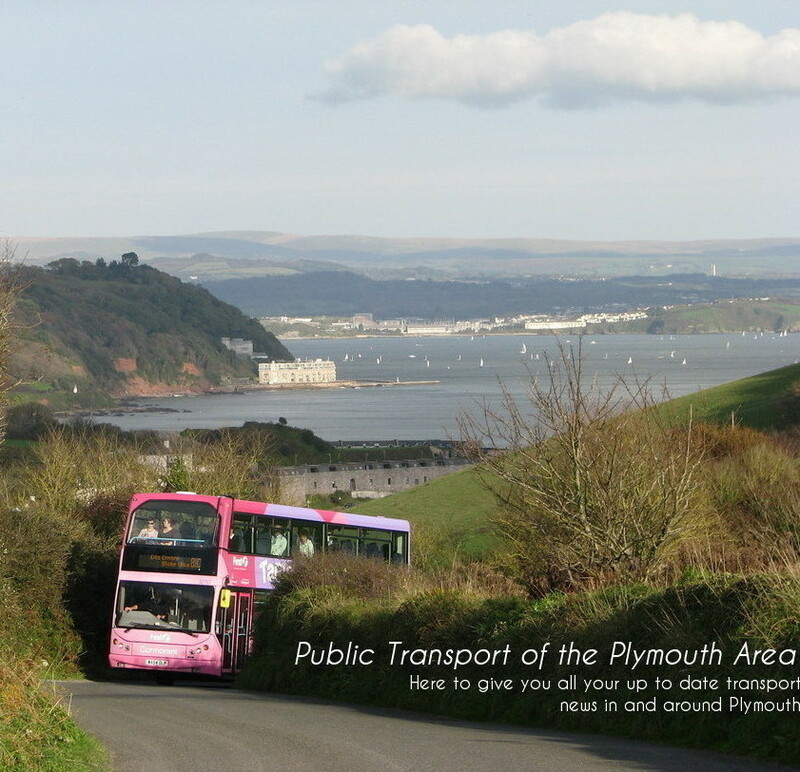 The line between Plymouth and Exeter St Davids will be closed every Sunday for the next few weeks while improvement work takes place, so anyone interested in rail replacement coaches , this is the time to go and have a look. I did so on Saturday (the only Saturday it will be happening in this period of maintenance) so will hopefully get round to doing a post on this during the week. But, with only 60 days left of school before the final A-Level exams, I shall apologise now, and most likely re-occuringly for the next 4 months for lack of posting during this hectic period. Our old friend UKT 552 is still going strong along with her sisters down in Cornwall still fitted with her original engine, where a majority have had to have been fitted with replacement engines, following several major problems with them, all within a very short space of time! 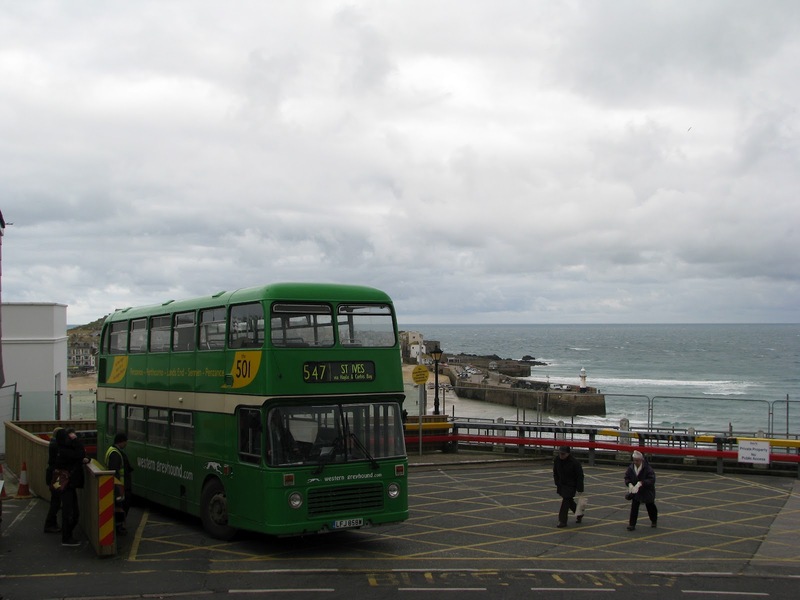 All have now returned to service, meaning we're seeing fewer and fewer old vehicles in service in Cornwall. You're hard pushed to find anything older than N reg these days, although there is 1, possibly 2 L reg Olympians. Still, its been a very impressive transformation over a comparatively short period. 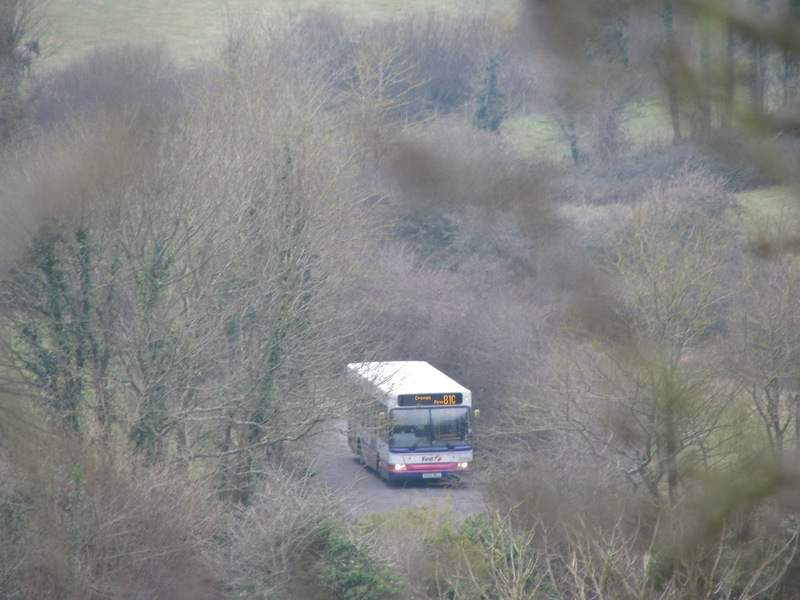 Since the withdrawal of the last VRs in 2006, few buses have actually stuck around in service for very long. Anyway, the point of this post was to illustrate the changes that have been made to UKT during the time she's been down in Cornwall. 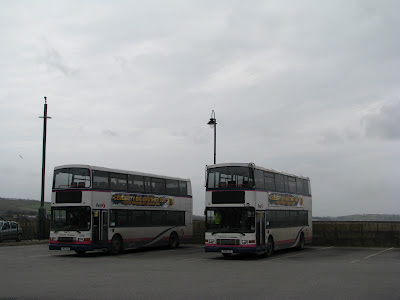 The most obvious one is the seating arrangements which originally were facing sideways along the bottom deck between the front, and the rear wheelarch. This was to allow loading and storage luggage to be easier, and to provide more space, when the buses were used originally on the Airbus services from the centre of London to Heathrow airport. The setup is now the more conventional 2+2 seating right the way down. 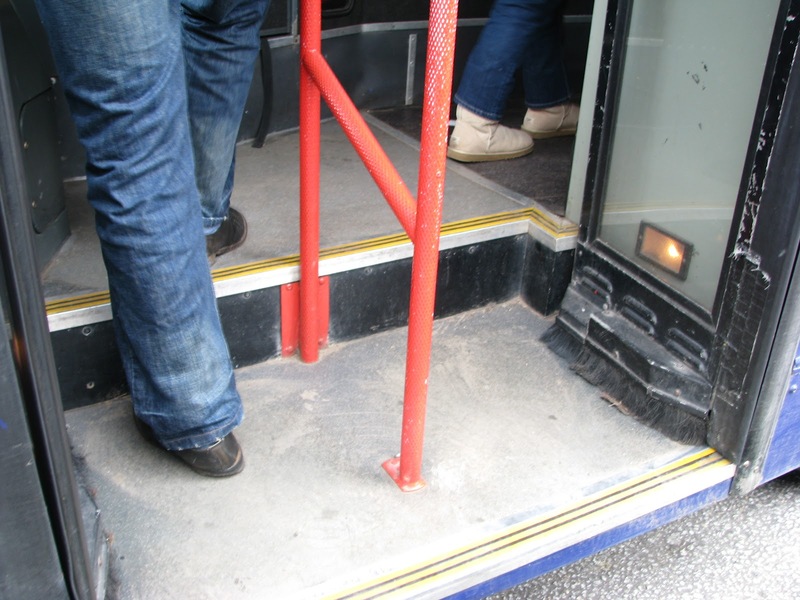 The strange change to the bus though, was that the wheelchair lift has been taken out, and replaced with a conventional step, as the photo illustrates. This seemed slightly strange, seeing as surely these Olympians would be able to keep going past 2015 DDA regulations, because passengers in wheelchairs are still able to board. Its true that the lifts have caused minor problems over the years, most namely being the safety mechanism which would disengage the gearbox when it 'thought' the lift was in use. With the roads of the Westcountry being so bumpy, what tended to happen was this would trigger, and take the bus out of gear while in motion, but as long as the driver knew how to rectify this, there was no real problem, so I'd doubt this is purely the reason why it has been taken out of UKT, although I can't think of a valid reason why, unless it had been damaged at some point. To my knowledge all of her sisters do still retain the wheelchair lift, although, I've never seen them used once! 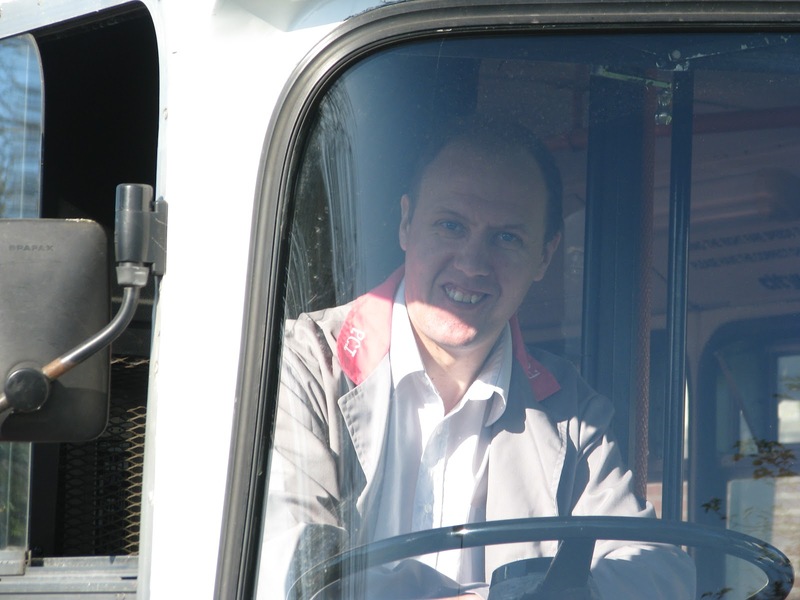 As is a long running tradition, many of Plymouth Citybus' castoffs are bought for further use thanks to their rigorous maintenance schedule and general treatment they receive from the company and drivers. Many of the Darts have made it into further use, with K102 SFJ being a fine example. She was spotted today in new ownership at First and Last Coaches still wearing the livery she left Plymouth wearing several years ago, even though this is her second operator since withdrawal from PCB. She had previously been owned by Aquarius Travel, before being sold on Ebay to First and Last a few months ago. K102 certainly looks like she has been well kept, but was one of the last things I expected to see while trundling through Cornish countryside! The Snap on Sunday this week comes from a vantage point I've always wanted to take photos from! This photo was taken on the fields leading out of Cawsand, and up Forder towards Whitsand Bay. Unfortunately, most of the photos didn't come out very well, I hadn't quite found the right spot in which to stand to get a decent angle, but this one I was pretty pleased with, just a shame it was a Barbie liveried Dart! Then again, anything bigger and the shot may not have worked as well as it did. 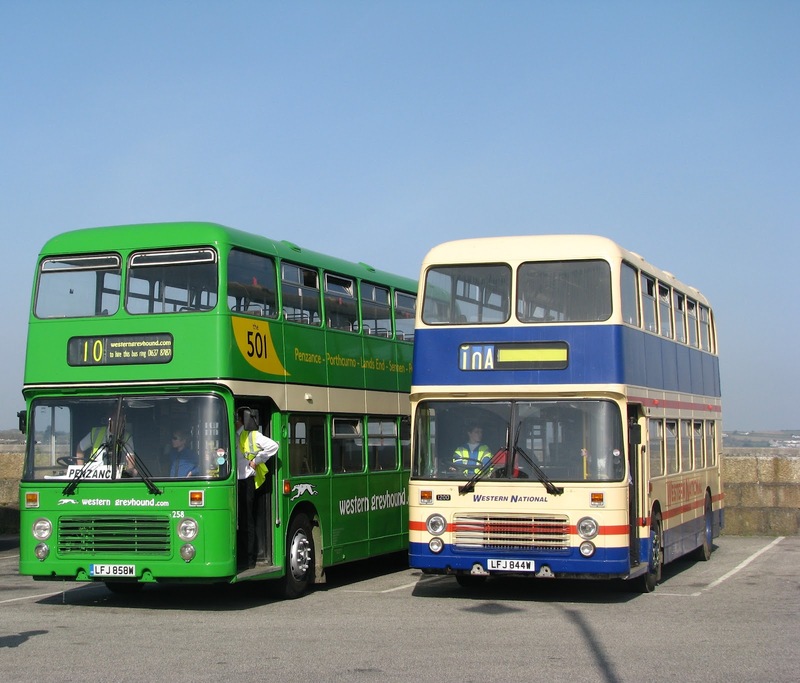 Devonian Motor Services have now added their A reg Leyland Olympian to Ebay for onward aquisition following the sale of the Leyland Atlantean on Ebay a few months ago. As reported on last year, this Olympian is a very good example of the breed, and has been lovingly restored and really looks the part in the cream livery. 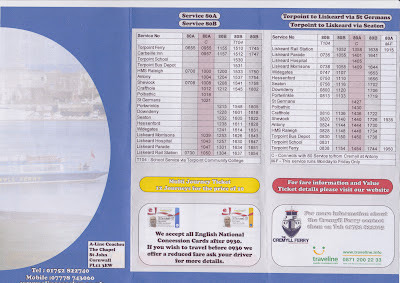 All signs unfortunately do seem to point to the withdrawal of the open top service in Paignton from Devonian, with competition from Riverlink and Torbay Sightseeing. Comparing Devonian to Torbay sightseeing, the fares are a substantial amount cheaper, as well as the vehicles appearing in a much more professional guise, so its a shame they've lost out if lack of revenue is the case for withdrawing the operation. 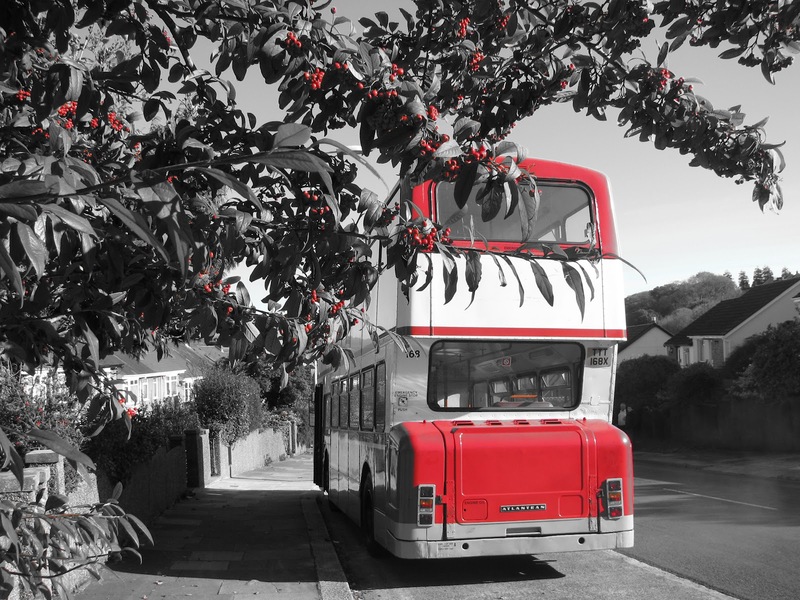 I'm sure we will start to hear the full story over the coming months, but it will be a sad loss to see these immaculately presented Leylands disappearing from Paignton's streets. With thanks to Tom Pearce I can bring you a couple of lovely shots of the first of the newly painted Dennis Darts that Target Travel have recently acquired. These are the first bought by the company to have Pointer 2 bodywork, and indeed the body suits the livery well. The slightly lighter green also improves it and you can directly compare it to the Dart sitting behind the bus in which the difference in shade is clearly evident. I think we can presume by the paper number in the window that the destination display isn't currently yet working, but indeed she does look very smart. Owing to the weather, few of the photos I took yesterday were of any real decent quality, but this one came out well, so here we go. The shot depicts The Ex-Truronian Dennis Dart KU52 RXJ at work on the 81C, carrying what looked to be a very decent load. She is seen coming down the hill from Great Park on her way into Plymouth. You can't tell from this shot, but there are patches that are starting to show her original identity of the very vivid green/indigo Trevithick Link livery she used to carry while at work at Truronian. Luckily, I did catch a shot of her on my very first spotting session down in Truro, although by this time, the company had just been taken over by First. Well, at last, the exam season is over once more, and some normality can return to my life after 2 months sitting a desks with heads in assortments of economics, geography and general studies (watch it!) text books. 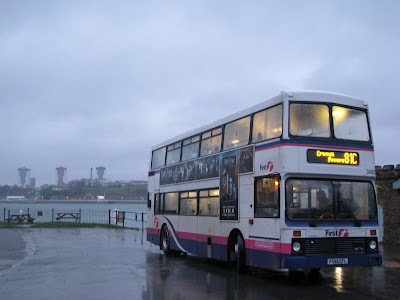 The first thing I was keen to tick off was Torpoint's latest addition, this being Volvo Olympian P568 EFL. She's certainly a very good example of the batch, with a very strong engine making mince meat of some of the hills that even the Tridents struggle with. The bodywork and general interior is very tidy indeed, and has obviously been well cared for in Southampton, its just a shame that the interior is just standard 'bus seats'. After a full trip of the 81C from Royal Parade to Cremyll aboard her, I was a little worse for wear in the back department, its just not a shadow on the plush coach seating of the K-ORLs! No where near as exciting either, but no doubt its the best we could have hoped for, its about the most interesting thing you'll still find working daily at FDC, especially seeing as none of the 4 K-LAEs made an appearance today. You may have also noticed the photo isn't really representative of today's murky wet and freezing conditions, so here's an example of today's photography, in the same location. 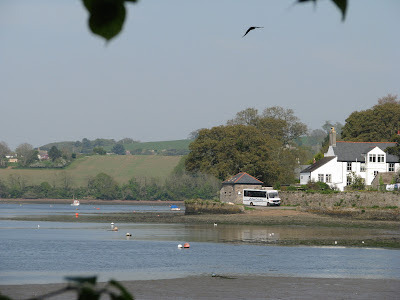 The, dare I say it, heartbreaking thing, was that at the same time I was swanning off to Torpoint on P568, I missed what frankly would have been the spot of the decade. 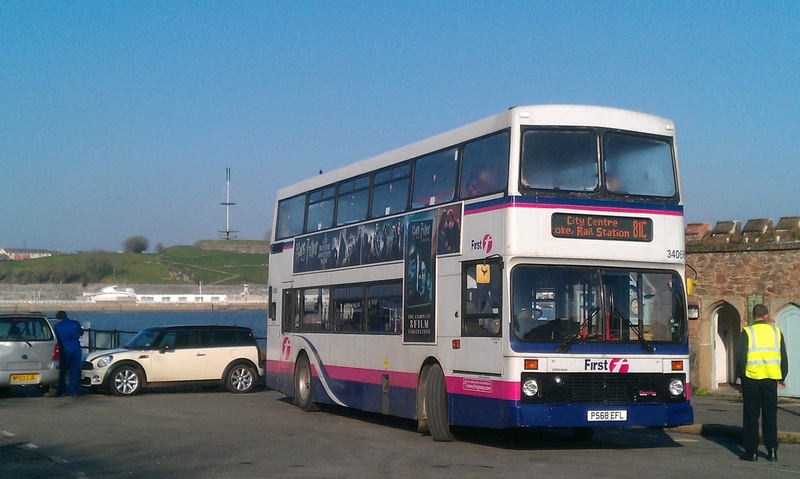 For the first time in nearly 6 years, a Bristol VR was prowling the streets of Plymouth in public service! I kid you not, Western Greyhound's LFJ 858W was used on service 592 to and from Liskeard, and down into St Columb today, in place of the usual Mercedes Vario! I could kick myself for taking a trip on a vehicle some 17 years younger, but then again it is simply the last thing you would expect to see on a miserable February Saturday in Plymouth. 858's working sees the VR return to service in Plymouth for the first time since LFJ 844W was withdrawn from Torpoint in August 2006. With any luck (and with enough begging to the MD!) who knows what we may see in the future. 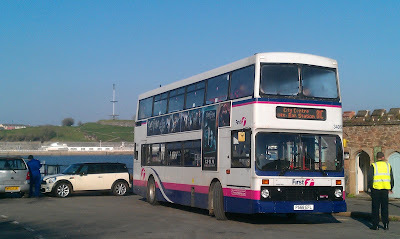 LFJ 858W has been used in regular service down in Cornwall over the past few weeks owing to a shortage of serviceable Volvo Olympians, so we may indeed see her working again around the region, its just a matter of tracking her down! Ironically I have a photo of the most recent, and penultimate VRs together while running in preservation at the 2010 Penzance Bus Rally.